Can MOSE technology save Venice from the water? Since it was built (more than 16 centuries ago), Venice has always aroused attention and curiosity by its architecture, its paintings, its sailors… Today, it’s the high water levels that agitate Venetians and tourists, as well as the scientific community. Can the highly ambitious MOSE project end the ever-higher and more frequent floodings of St. Mark’s Square and its canals? Since the beginning, water has fashioned Venice, with the charm of its canals and the bravery of its navigators, beginning with Marco Polo. Water could also be what leads the city to its loss. How much longer will this island city (118 islets over 50 km2) located in the Venetian Lagoon be able to suffer the ever more violent whims of the Adriatic Sea? 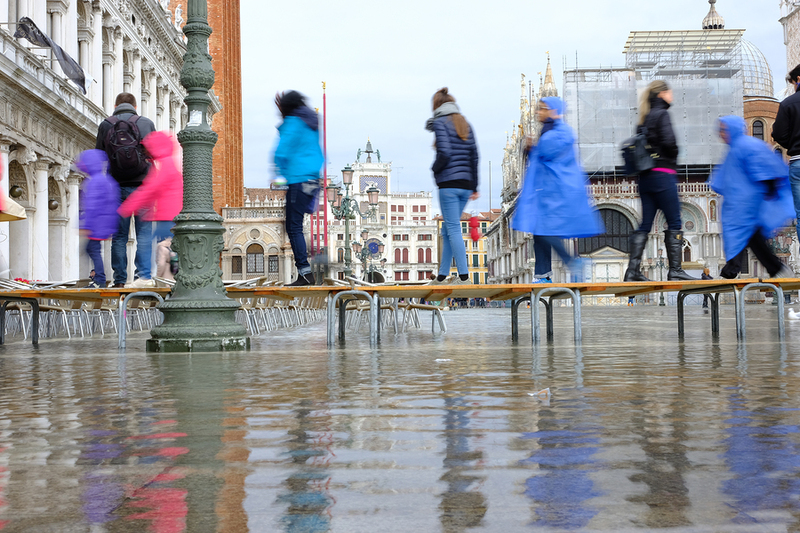 The Great Flood of November 1966 – which saw the water level of St. Mark’s Square rise 1.93 metres – is unfortunately no longer an exception: high tides are multiplying and may now reach three metres. However, they are not the only cause of the city’s degradation. The construction of the “tanker channel”, digging of 6,000 wells under the lagoon and the annual loss of one million m3 of sediment that can no longer be secured due to the constant traffic of boats are all elements threatening the bridges, docks, and foundations of homes and historical buildings. During the 30 years in which various players have consulted, hesitated and dithered to find a solution, Venice has continued to sink (15 cm between 1970 and 2000). An ambitious project has come to light – MOSE. There are many who have made their contribution with multiple plans, programs and others for Venice, such as UNESCO and the Ministry of Infrastructure. This is how the Modulo Sperimental Elettromeccanico Mose (pronounced Moise in Italian) stands out… Since 2003, engineers and technicians have been working on a system of movable valves to prevent the water from passing through. This is a gigantic project: construction of 78 dikes (each 20 m wide and 25 m long) over a distance of 1600 metres between the Adriatic and the lagoon, which will rise, thanks to its movable valves, once the level of the tide exceeds 110 cm. With this electromechanical challenge, Venice is once again talking about it… but not necessarily for the right reasons: the project’s cost has ballooned by four (1.8 billion to 5.5 billion euros between 2003 and today), financial scandal tarnishing one hundred people, significant delay in delivery, collateral problems that may damage the lagoon’s ecosystem. While some are confident in the skills of the Venetians – who have already shown, over 1,500 years ago, their ingenuity in construction, in particular houses on stilts – others are more circumspect about the chances of success in saving the Venetian palace and canals. Would these be the same people who decided in 2013 to launch the ambitious “Venice Time Machine” project, consisting of digitizing 80 km of archives of the Serenissima, convinced that tomorrow Venice will only be visited virtually?